Finally, it's time for evidence-based experimentation. A number of outlets have covered Finland’s experiment with basic income on a national level. However, few uncover the reason why Finland can pull off such ambitious policies in an age where so many government are left powerless with even the smallest of changes in the way society works. The bigger change is buried under the stream of international news regarding the world’s largest basic income trial. With a closer look, one can see that basic income is only a tip of the iceberg. During the past year, Finland has explored possibilities on how to reform some of its policy making functions with and idea to move from speculative to evidence-based and experimental. So how did Finland become the first country in the world to experiment basic income in a large scale? Behind the basic income experiment is a longer continuum of Finland wanting to turn national governance agile and human-centric. In the Spring of 2015 Demos Helsinki, a Nordic think tank, together with Aalto University, was leading a strategic research and design project for the Prime Minister’s Office. They’ve been pioneering a form of deciding upon public policy where people actually think through the problems at issue, think about them, consider solutions, test a few of them, then implement the best. 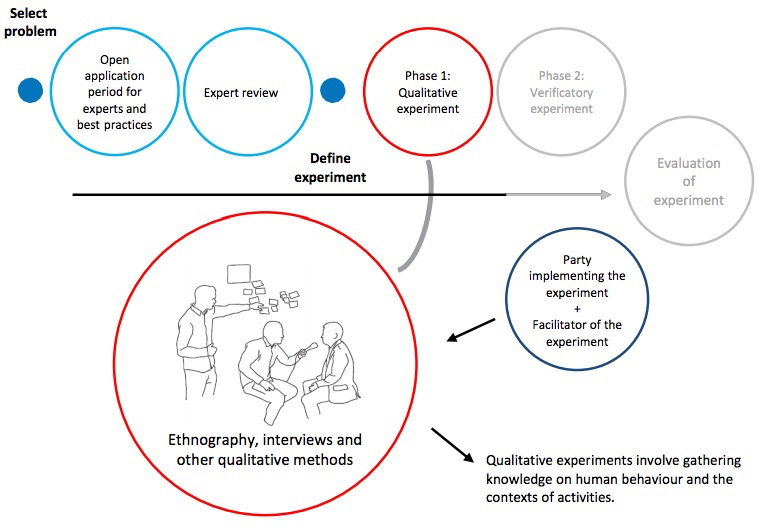 As a result of the project, Demos Helsinki proposed a new, quick-to-implement model for including experiments and behavioural approaches into Finnish policy design. The experimentation model and short introduction to it has been translated into English and can be found here. Would Finland succeed in integrating experiments to its governance, this would present a landmark event in history of policy making. Instead of speculating on the impact of proposed policies – such as basic income and environmental policies – Finland will now experiment, measure, and scale. “It’s bizarre that the rest of the society works with testing, prototyping and then scaling, but not governance. It makes politics very theoretical, slow, and to rely on guesses as opposed evidence,” explains researcher Mikko Annala of Demos Helsinki. He was part of the team that designed of the experimentation model. Finland is taking many steps in order to become the first truly experimental nation in the world. First, ministries and municipalities are picking experimental methods. For example, there are over 100 mobility experiments being planned and executed, many of them under the administration ministry of traffic and communications, which plans to turn Finland into a one giant Mobility Laboratory. Second, the Prime Minister’s Office is currently investigating how to transform funding so that it can better support different experiments. This investigation is also undertaken by Demos Helsinki. 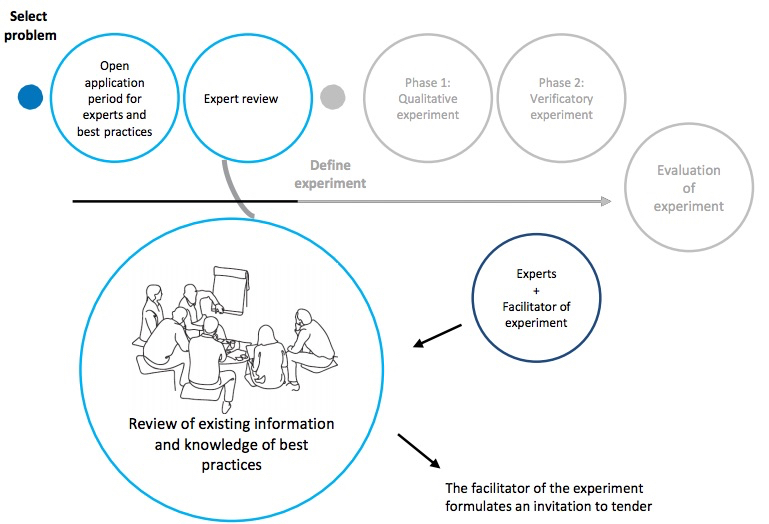 Third, Finland is creating new platforms for communicating about experiments: sharing information, know-how, and related practices. As the first step the Prime Minister’s Office is setting up the an experimentation office to oversee the experiments and scaling. How Are the experiments done? 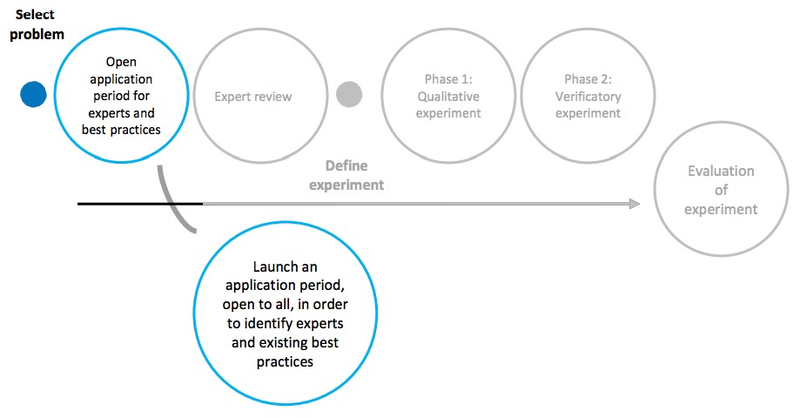 The process inspired by design thinking outlined in the report has six distinct steps. The primary intention of the first phase is to sharpen our understanding of what is already known about the challenges and opportunities associated with the political objective in question, and to establish the ‘unknowns’ and what still needs to be clarified in terms of the steering methods and the related formation. The next step is an expert workshop, at which a systematic review of the behavioural science literature related to the objective and the best practices is drawn up. The qualitative stage of the experimental phase involves familiarisation with the theme based on lighter methods. A more widely applicable, precisely measurable verificatory experiment is conducted on the basis of the findings. 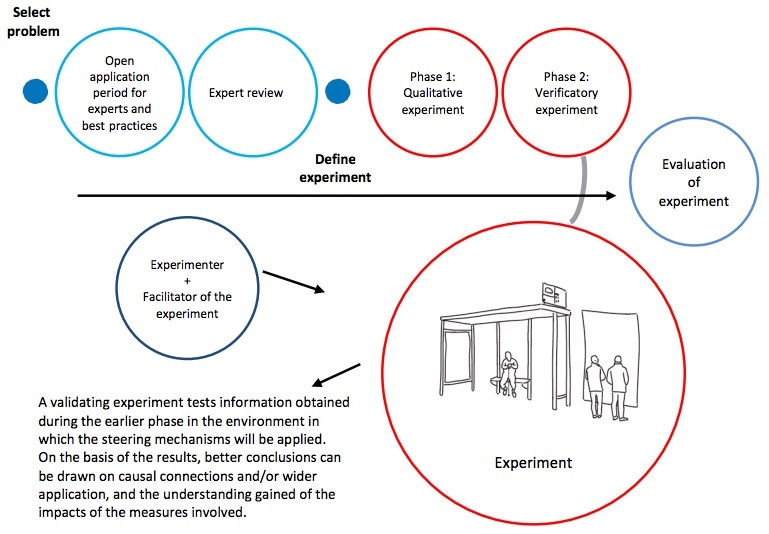 The verificatory stage of the experimental phase involves familiarisation with the theme through quantitative factors that enable a causal connection to be identified. Precise measurability is the aim during the experiment. Germany’s Basic Income Experiment: What Would You Do If You Had $1,100 a Month With No Strings?